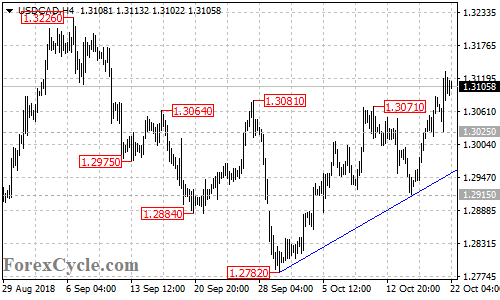 USDCAD extended its upside movement from 1.2782 to as high as 1.3132. As long as the price is above the bullish trend line on the 4-hour chart, the upside movement could be expected to continue and next target would be at 1.3200 area. Near term support is at 1.3025, only a breakdown below this level could bring the price back towards the bullish trend line.